Don Juan and Miguel always have their hand in a varying amount of projects in addition to their busy performance schedule. This includes the work they do with their production company Blind Dog Entertainment to the Renaissance Festival attractions they design and build. 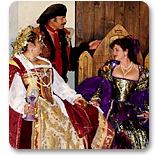 They own and develop various enterprises at many of the Renaissance festivals they perform at. 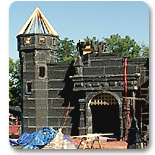 Since 1995 they have built two dungeons (North Carolina and Pennsylvania), an archery game (New York) and a life size maze (New York), with another dungeon scheduled to be done for the 2006 season at the Sterling, New York festival. Working with Linda Demian Granados ,a sculpture major educated at Maryland Institute of Art, they are hands on in designing and building so as to produce the highest quality in their field of exhibit. Please be sure to check these pages frequently for updates on their current projects from building new attractions to working on new movies.